I don’t know what it is in particular, but there was something about the Blue Jays 6-5 win over the Minnesota Twins that was strangely satisfying. Was it because they turned the tables on the Twins, who the previous night were on the winning end of the 6-5 boxscore? Possibly. I think what made that game so enjoyable to watch was it was just a good old fashioned American League game. For the most part, all the Blue Jays came out and did what they were supposed to do to win. Everybody came out there and executed their roles to a T.
Marc Rzepczynski, while not brilliant … showed great composure during his first major league start since September 1st last season. He did a great job of keeping the Twins hitters off balance, striking out seven and walking only one batter. 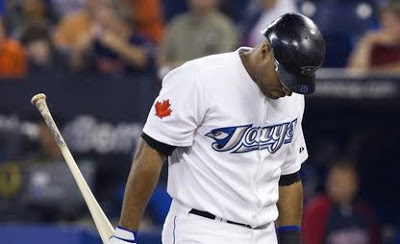 As of late, the Blue Jays offense has been very sporadic: a home run here, and home run there … but against the Twins, they battled back and forth and never really gave up. Of course, the Twins outfield definitely helped their cause, and those lucky breaks paid off. I know it seems like a small feat, but to me it was very impressive to see Alex Gonzalez sacrafice himself in the bottom of the eight and get a fly ball deep enough to score Fred Lewis and tie the game. Gonzalez was behind in the count 0-2 and is known to whiff at almost anything on the outer half of the plate, so it’s not uncommon to see him strike out in that particular situation. Sometimes, its plays like that which really make me appreciate how intricate the game of baseball really is. Credit goes to Jose Bautista for hustling around the basepaths for an inside the park home run. I think that also happened to Bautista a few weeks ago as well, but it was scored a triple with a thowing error, so this time it was nice to see Jose get credit for the inside the park home run. And I also tip my cap the Blue Jays bullpen for yet another solid effort. This time, Cito Gaston made the correct choice each time, using each reliever in the perfect situation and for the perfect duration. I guess that’s the thing about great bullpens: when they run like a well-oiled machine, not many people take notice. It’s only when the relievers implode that suddenly all eyes are on the closer, manager, setup man, etc. Now, the Blue Jays may be 4-11 in their last 15 games, but they have managed to make it to two rubber matches with two division leaders in the American League, and I think that’s a impressive feat in itself. I like your style, Mattt! I'm just hoping they finish the first half over .500. That would exceed any expectations I had for the Jays at the beginning of the season. And did anyone else get a load of Morrow's sweet new scumstache in the dugout? He went from Bautista-level beard to filthy 70's lounge lizard overnight, and it's amazing. I hope he has it for autograph signings tonight, it'll make every girl that goes near him automatically pregnant. sadp, no I didn't catch it. The last I saw, he had a beard of Bautista proportions, but will try to keep an eye out for the new stache.